The Eponymous Flower: Sister Lucia to Jesuit: "No, Father, Many, Many Are Lost"
Sister Lucia to Jesuit: "No, Father, Many, Many Are Lost"
Dante und Virgil in der Hölle. (kreuz.net) Archbishop Gerhard Ludwig Müller -- the faith gardener of Benedict XVI. -- is of the opinion that there are only few in hell. Writes the site of the Society of St. Pius X, 'pius.de' early in August. 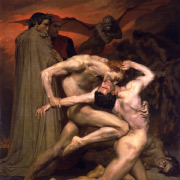 Are Most "Individuals" in Hell? "Who, as many and indeed the generality of people, offers a radical resistance against love till death, escapes from our knowledge not only accidentally but in principle as well. We should however hope and pray that generally, every man comes to goal of the outreached desire of God's salvation." And: "Humanity definitely comes in Christ to God as its only goal, may perhaps also remain at odds with God." "Enter ye in at the narrow gate: for wide is the gate, and broad is the way that leadeth to destruction, and many there are who go in thereat. How narrow is the gate, and strait is the way that leadeth to life: and few there are that find it!" "The life is more than the meat, and the body is more than the raiment. Consider the ravens, for they sow not, neither do they reap, neither have they storehouse nor barn, and God feedeth them. How much are you more valuable than they? And which of you, by taking thought, can add to his stature one cubit?" "Narrow is the gate and strait the path that leadeth to destruction, but hardly anyone finds it". On page 562 Msgr Müller maintains that Christian theology perceived "the teaching of the eternity of the torments of Hell as the crux of the Gospel". Actually 'pius.info' shows, that that isn't true. The salvific medications on Hell have led countless people to penance. The website mentioned the Spiritual Exercises of St. Ignatius of Loyola (+1556). There the consideration of Hell plays a very important role. According to St. Ignatius it drives one on that "if I were to forget the eternal love of God because of my errors, the slightest fear of those punishments assist me in not falling into sin." St. Theresia of Avila (+1582) observed her vision of Hell as one of the greatest graces of her life. In times of spiritual dryness the thoughts of Hell made more of an effective help against the selfishness in sin than the thoughts of the love of God. In Fatima the Mother of God even showed little children Hell, in order to fill them with fervor to pray and do penance for the salvation of sinners. The site also mentioned the destructive influence, which the baseless assertions of Msgr Muller have on the salvation of souls. Because: "If the only people in Hell are a few human beasts like Hitler, Stalin or Jack the Ripper and that one may even hope for them, that they sing Hallelujah in the chorus with their victims, then the average man doesn't need to worry about his salvation." The Church optimistic of salvation will be an instrument of the devil, that the sinner is deceived by this, and that he is actually in acute danger of falling into Hell. Such a Church makes it unnecessary to prove the present developments. But there's always the hope of salvation? The seer of Fatima, Sister Lucia de Jesus dos Santos († 2005) said in an altercation with the the salvifically optimistic Vatican spokesman, Father Federico Lombardi: "Father, there are many who are lost." The Jesuit objected: "Sure, the world is a cesspool of vice and sin. But there's always the hope of salvation. " The nun protested vigorously: "No, Father, many, many are lost." BUT THESE MODERNISTS THINK THEY KNOW MORE OF GOD AND HIS KINGDOM THAN AUGUSTINE AND AQUINAS. But what do you expect from the Guardian of doctrinal purity, doctrinal purity? Jesus and St Faustina.. Read what He revealed to her... His instructions in order to tap onto His Divine Mercy.